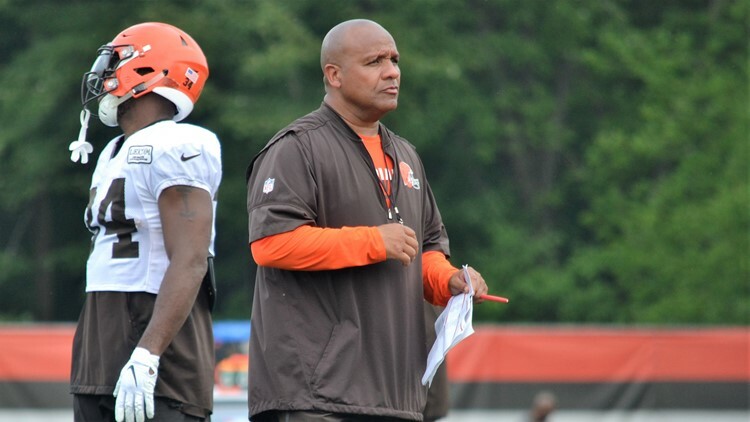 Cleveland Browns coach Hue Jackson looks on at a drill during Monday's practice at the Berea training facility. Coach Hue Jackson told free-agent receiver Dez Bryant that the Cleveland Browns will have the greatest turnaround in sports history. Coach Hue Jackson is confident the Cleveland Browns are a team on the rise after struggling through the first two years of his tenure, and he is not afraid to stand by those words, doing so in a visit with free-agent wide receiver Dez Bryant on the third episode of “Hard Knocks: Training Camp with the Cleveland Browns” on Tuesday night. “I tell you this opportunity that’s sitting before you, to me, is kind of unique in a sense that we’re at a time where I think we’re about to do this [uses hand to signal rising], at a time where you could help us get this organization back to where it rightfully should be,” Jackson said. In search “for realness,” Bryant seemed impressed by what Jackson and the Browns’ front-office staff were pitching to him. “Coach, it’s new to me,” Bryant said. “I’m just being honest. All this is new. Just being honest, the way you’re expressing yourself, the way you’re talking to me, we barely know each other, and I feel comfortable. That’s what these players want. Referencing Bryant’s quest for “realness,” Jackson brought up the presence of fellow receiver Jarvis Landry, who has been an outspoken, passionate leader on the offense throughout his first training camp with the Browns. In addition to the visit from Bryant, “Hard Knocks” briefly featured the return of Josh Gordon, who missed the first three weeks of training camp while handling personal matters. At the end of the third episode, Gordon met with strength and conditioning coach Larry Jackson and was shown lifting weights and running wind sprints in the Browns’ indoor facility, The Casey Coleman Fieldhouse. From taking points off of the scoreboard to giving automatic first downs that made a first-half field goal attempt a closer and allowed the Buffalo Bills to exhaust the clock late in the game, the Cleveland Browns struggled with penalties throughout their 19-17 loss at FirstEnergy Stadium Friday night. All told, the Browns committed seven penalties for 70 yards in the loss, which was on the heels of a 13-penalty performance for 141 lost yards in the Week 1 win over the New York Giants at MetLife Stadium in East Rutherford, New Jersey. “The discipline of this football team has got to get better,” Jackson said. “What I don’t like doing is losing when we self-inflict from penalties, from penalties. And it cost you an opportunity to win a football game, and that’s just the truth. Landry reached that limit on August 14, as he was driven to the ground by defensive back Terrance Mitchell, and responded by springing to his feet, throwing the ball in the veteran corner’s facemask and tussling to the ground before teammates broke them up. “I’m not playing with him, period,” Landry said to his teammates. A Browns fan for many years, country music superstar Brad Paisley visited Browns practice on August 14 and spent time with players, coaches and decision-makers during the visit. From talking to GM John Dorsey about Baker Mayfield’s arm strength to addressing the team, breaking down the huddle and getting a special invitation to the famous “Quarterback RV,” Paisley had an action-packed visit to Berea. The Browns have gone to the dogs…somewhat literally. A couple years ago, the Browns adopted a chocolate Labrador retriever, “Moose,” and while he spends most of his time near the front entrance to the building, he has an all-access pass of sorts, which includes getting to visit with Jackson and Dorsey in their respective offices.